Harvard University Press, 9780674975774, 464pp. No sitting federal judge has ever written so trenchant a critique of the federal judiciary as Richard A. Posner does in this, his most confrontational book. Skewering the politicization of the Supreme Court, the mismanagement of judicial staff, the overly complex system of appeals, the threat of originalism, outdated procedures, and the backward-looking traditions of law schools and the American judicial system, Posner has written a cri de coeur and a battle cry. With the prospect that the Supreme Court will soon be remade in substantial, potentially revanchist, ways, The Federal Judiciary exposes the American legal system's most troubling failures in order to instigate much-needed reforms. Posner presents excerpts from legal texts and arguments to expose their flaws, incorporating his own explanation and judgment to educate readers in the mechanics of judicial thinking. This rigorous intellectual work separates sound logic from artful rhetoric designed to subvert precedent and open the door to oblique interpretations of American constitutional law. In a rebuke of Justice Antonin Scalia's legacy, Posner shows how originalists have used these rhetorical strategies to advance a self-serving political agenda. Judicial culture adheres to an antiquated traditionalism, Posner argues, that inhibits progressive responses to threats from new technologies and other unforeseen challenges to society. 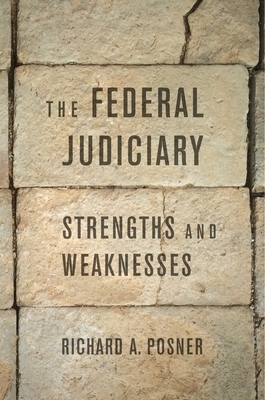 With practical prescriptions for overhauling judicial practices and precedents, The Federal Judiciary offers an unequaled resource for understanding the institution designed by the founders to check congressional and presidential power and resist its abuse.